Official group for One Maze Fits All! 3c PER USER. Just stand on the Stella Tile near the door to come in. Not recommended for beginner mazers. Fastpass can be bought from Maniacandr or Orcheta. This costs 7c. You can reenter the game after its first 2 min. 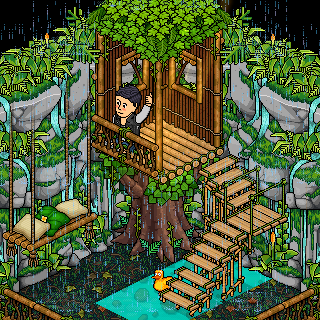 [Habbox] A Walk in the Park! Making it easier or possible for (someone) to do something by offering them one's services or resources. Top two to win: CBB5 winner and favourite Bagooble and gaming/glitching expert and with the most predictions to win lChecho. the sky is not the limit when there are footprints on the moon. Remember when I asked for your opinion? Me neither. Open your eye! Not your mouth. Why follow other peoples footsteps when you can create your own footprint. Room sponsored by: Radioactivist aka Tom. Al Gore invented the internet. Room sponsored by: BLINKRULE- aka Jay. [HFFM] Hit The Wall ! Taken in this room on 22 December 2017 and received 1 likes. Taken in this room on 15 April 2017 and received 1 likes. Taken in this room on 14 April 2017 and received 0 likes. Taken in this room on 8 February 2017 and received 1 likes. Taken in this room on 4 July 2016 and received 2 likes. Taken in this room on 31 May 2016 and received 0 likes.